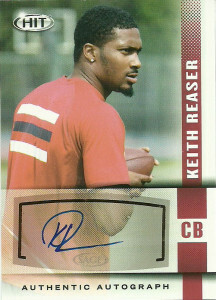 Keith Reaser played at Florida Atlantic and was an impressive athlete. He surprised scouts when he did 22 reps of 225 pounds on the bench press on top of the 4.32 40 he ran before he tore his ACL and knee up. Coming up to the draft, Reaser wasn’t even sure he’d be drafted, but he had been in contact with the 49ers who were interested. They selected him in the 5th round of the 2014 NFL draft. Reaser, still coming off the major knee injury still had rehab ahead of him. To most scouts, Reaser was seen as a value pick. He saw limited playing time in 2015, recording 8 tackles. Keith was one of 7 cornerbacks that made the squad in 2016.